That is bizarre beyond words, how do you run up a hillside on tippy-toe? These London Marathon charity costumes just got sillier by the year. Another final frontier is crossed as atomic mutation makes Star Trek: The Animated Series’ cosplay possible. Why the red, orange and yellow bunting? It looks as if the curtain’s rising on the strangest Christmas panto ever. Illustrated: Either the happiest or the saddest day of Carl Sagan’s life. Wow. A Flock of Seagulls twofer. ‘I Ran” AND ‘Space Age Love Song’. Per-for-mance dr-ugs in sport have gone too far. 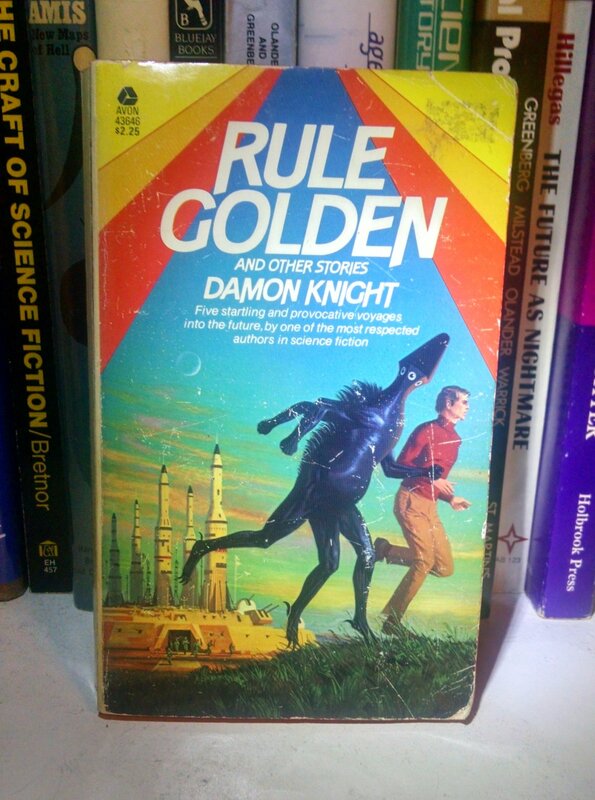 Rule Golden and stories other by Knight Damon. Rule Golden: When touring the nuclear launch facility, don’t. touch. anything. You’re getting this all wrong. It’s just some man and his alien friend out for a jog around the rocket launch facility (which is filled with Saturn V knockoffs for some reason). Nothing to worry about. Sorry, @B.Chiclitz, but this pair seems to be more side-by-side, (or neck and turtleneck). Perhaps Patrick McGoohan and his alien buddy have just realized that, inside of rockets or not, several huge containers of rocket fuel should not be left free-standing right next to one another where they could tip over. Awesome comment by Francis Boyle at #7. Good show, Sir. Good show.